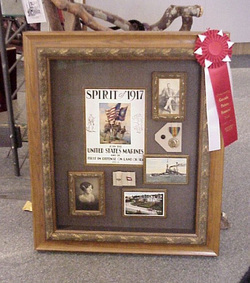 This box was completed for a framing competition. The theme had to be historical and limited to a certain size. I tied for first place in the Cascade Picture Framers Guild competition. I designed the box using Larson Juhl moldings The outer molding had to be modified by adding a 3" deep oak box to the back and staining to match the face frame. I also had to build an inner frame around the opening of the face frame. I used other frames in the set to accent the photographs and fillets around the postcards and poster. I used an olive hand-wrapped silk to cover the mat and sides of the box. A beige suede was used to make the platforms that hold the rings and pins. The box was assembled with Tru-Vue Museum glass and all mats were preservation quality. The frames around the photographs were lined with an aluminum barrier tape and the photos, poster and postcards were mounted on rag. Framed mask sample by Larson Juhl. The mask is floating on a Crescent Suede with a top mat of the same suede lined with a fillet to accent the mask. The sides of the box are lined with the same suede used for the mat. Larson Juhl used Tru-Vue museum glass. All the mats are preservation quality. This piece was part of a screen of bamboo that had broken. 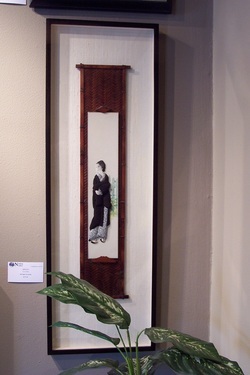 The figure is padded silk and floated on top of a silk wrapped board on top go the screen. I used a nubby, raw silk under the screen and to line the sides of the frame. The frame is a walnut. spline joined frame stained espresso. This piece was finished with conservation clear glazing.